Susan Heim on Writing: Shadows Fall Away Book Tour: "Jack the Ripper and Why He Still Fascinates Us" ~ Guest Post by Author Kit Forbes, Plus a Giveaway! Shadows Fall Away Book Tour: "Jack the Ripper and Why He Still Fascinates Us" ~ Guest Post by Author Kit Forbes, Plus a Giveaway! Mark Stewart is one incident away from becoming a juvenile delinquent, and his parents have had enough. They ship Mark off to London, England, to stay with his eccentric Aunt Agatha, who is obsessed with all things Jack the Ripper. After a strange twist of luck, Mark is struck by lightning, and he wakes to find himself in 1888 Victorian London. His interest in a string of murders that Scotland Yard has yet to solve make him a likely suspect. After all, why would a young boy like Mark know so much about the murders? Could he be the ripper they’ve been searching for? Convinced the only way to get back home is to solve the murders, Mark dives headfirst into uncovering the truth. Mark’s only distraction comes in the form of the beautiful Genie Trembly, a girl who is totally out of his league and who may have already caught the attention of the infamous ripper. To save her, he’ll endanger both their lives, and risk being trapped in the past forever. I think the main reason Jack the Ripper still fascinates a hundred and twenty-six years after his last murder is because he was never officially identified. In recent years there have been quite a few books and TV documentaries with criminologists and forensic specialists and former police detectives, and while they give very plausible ideas on who the murderer of the women in Whitechapel was, they’ve always been anticlimactic in that “Jack” was undoubtedly an ordinary person with mental problems. That seems callous, and I don’t mean to be, but to me the timeless pull surrounding the Ripper murders lies in the endless possibilities of who the killer could have been. People of the time were certain that no wealthy person -- and certainly no woman -- could have committed the crimes, but we’ve seen in our own 20th & 21st centuries that anyone is capable of such violent acts. One of my favorite books (Prince Jack by Frank Spiering) features the scandalous theory that Jack the Ripper was actually a member of the British royal family. There’s also the timing of the murders that lends itself to multiple theories of who the killer might have been. I read a post on a forum some time back that stated the murders occurred within a week before or week after a full moon. Coincidence? Probably, but for the imaginative it could tie in to things as “out there” as dark magical or Masonic rituals or even some weird werewolf compulsion. The reason Jack still fascinates is the reason my Mark was dragged to a Ripperologist’s conference. Who doesn’t love a good mystery and the chance to play armchair detective? Kit Forbes has been a lover of books, history, and all things paranormal for as long as she can remember. She lives in Western Pennsylvania with her youngest daughter and an assortment of cats who give new meaning to the world bizarre. Click Here to Follow the Tour! 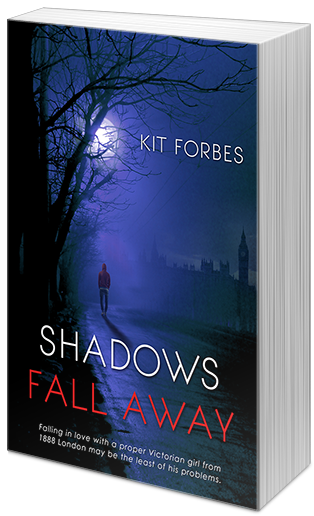 Five (5) winners will receive a digital copy of Shadows Fall Away by Kit Forbes (INT). Enter through the Rafflecopter form below. This book sounds awesome! I've read a lot about Jack the Ripper, so I'm very curious. I rather like the way that the novelist Robert Asprin took care of Jack the Ripper! Scottland yard, mystery, Jack the riipper, looks like a great suspense! Definitely snapping this one up to read!! Thanks for the heads up!!! Plagues of Eden Book Tour: Read an Excerpt! Literary Addicts Weekly Meme: What Am I Reading?